Shakespeare has never been so groovy. This ’60s-inspired Beatles and Bard fusion is so much fun it will have you singing and clapping along. And it all starts with a full-on WWE style wrestling match! I bet you never thought you’d see that at a Shakespeare show — but this is far from your average Shakespeare production. It’s full of soul, all the creative elements have perfectly come together, and it will leave you with a new-found understanding of the Bard’s relevance. It’s what all Shakespeare adaptations strive to be. From the first chords of “Yellow Submarine” to the happily ever after, the live music guides us through and helps tell the story. With 25 Beatles songs included, a lot of Shakespeare’s text has been cut; but the balance feels right. The songs have been incorporated seamlessly into the narrative and they fit so well it’s a wonder this hasn’t been done before. It’s love at first sight for Orlando (Nadeem Phillip) and Rosalind (Lindsey Angell) as they watch the wrestling match, and we buy it right away due to their authentic performances. Things quickly grow complicated, however, as Duke Frederick (Scott bellis) orders Rosalind to leave Vancouver. The Duke, having recently taken over from his brother, only allowed his niece to stay because of her close friendship with his daughter, Celia (Harveen Sandhu). Celia, high maintenance and seemingly in love with her cousin, decides to go with Rosalind. They disguise themselves for their journey to the Okanagan forest. Orlando also ends up in the Okanagan after he finds out his brother plans to have him killed, and the former Duke has been living there since being usurped. Jacques (Ben Carlson) provides some melancholy to contrast the prevailing optimism, and his “All the World’s a Stage” monologue is spot on. 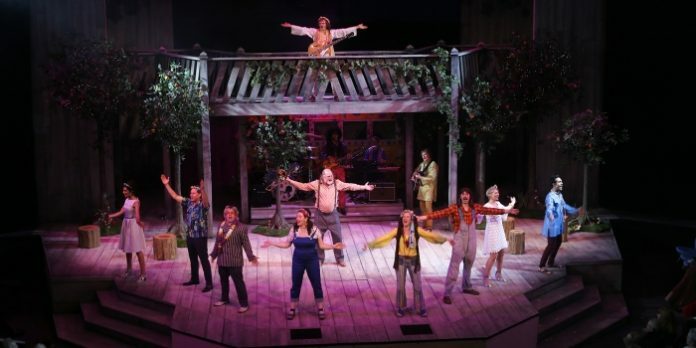 This is appropriately followed by “Let it Be.” When Rosalind finds Orlando’s love note, we hear “Eight Days a Week,” and when things start looking up for everyone, “Here Comes the Sun” infuses the stage with hope. “Helter Skelter” and “I Am the Walrus” even make the cut and add just the right amount of quirkiness to their respective scenes. By the time we get to As You Like It’s four wedding finale, it’s clear that the Bard and The Beatles agree: all you need is love.